Rockstar's Red Dead Redemption 2 is less than two months away, and we're just starting to really learn some of the nitty-gritty about Rockstar's down-and-dirty western. While we know the bare plot and setting, we'll know one thing for sure: It's deeper than Grand Theft Auto 5. "Grand Theft Auto V set a pretty high benchmark for us as a company, but even the PlayStation 4 and Xbox One versions of that game were based on technical concepts from the PS3 era," says Rockstar San Diego art director Josh Bass speaking with Hollywood Reporter. "Red Dead Redemption 2 is our first game for the latest generation of hardware, and was an opportunity for our teams to upgrade every single aspect of our approach to game design at once[.]" Bass says that this includes things like graphics, lighting AI, weather, sound, and animation. But more importantly it gives Rockstar "that power to create a world that goes far beyond anything [Rockstar] have ever done in terms of depth, interactivity and persistence." Director of art at Rockstar North, Aaron Garbut, added this is most prominent in the level of immersion in Red Dead Redemption 2. "When you first enter a town and you see the townspeople going about their business, building houses, selling papers, hanging out, you can instantly tell that we've never experienced this detail in an open world game before." Immersion is Rockstar's biggest goal according to the two. 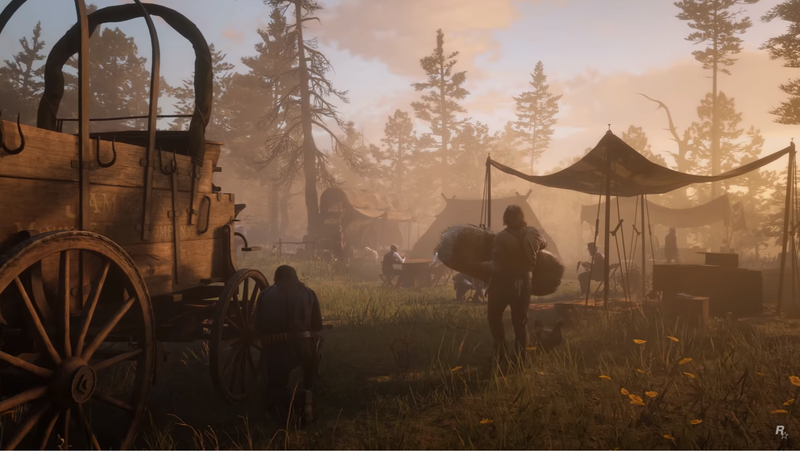 "Making the player forget they are playing a game, and instead leaving them with a memory of a place," is how Garbut summarizes Rockstar's goals with Red Dead Redemption 2. Red Dead Redemption 2 is coming to PlayStation 4 and Xbox One on October 26. Rockstar revealed character portraits and summaries of the main cast yesterday but for more info visit our Red Dead Redemption 2 guide for all the trailers, breakdowns, and info in one place.